Do you have any burning question that you need an answer to? Remember to send your questions to trulymakingadifference@gmail.com. I will be happy to help. Thanks to my readers and followers that are making use of the free questions and answers opportunities via email. You are making Myss Lafunky to be more zealous in the ministry and the foundation that God has committed into my hands. This week, I will be focussing on Purity. Purity in thoughts. Have you ever wondered how you can stay pure in your thoughts? Do you know what the consequences of an impure heart and impure mind are? Purity in thoughts is being free from sin in ones thoughts. Jesus pointed out how important this is when He said anyone who was angry at his Brother or Sister was a Murderer! (Matt 5:23) What?! Seriously?! He's gotta be kidding right? Then, He goes on to say that if you lust after a woman or man in your HEART then you're already guilty of fornication or adultery (Yep! All those sneak peaks at Cosmopolitan ladies and GQ men) (Matt 5:28). So, definitely, this purity in thought has got to be pretty important. Right? Purity - being free of sin and being uncontaminated. Purity is first for the benefit of the one who remains pure, then, others around you. To achieve purity in thoughts, we need to be truly committed to God. Why is it important to be pure in thoughts? This question can be re-phrased as: why is it important to live a life free of sin because so far, we can infer that purity in thought leads to a life free of sin. 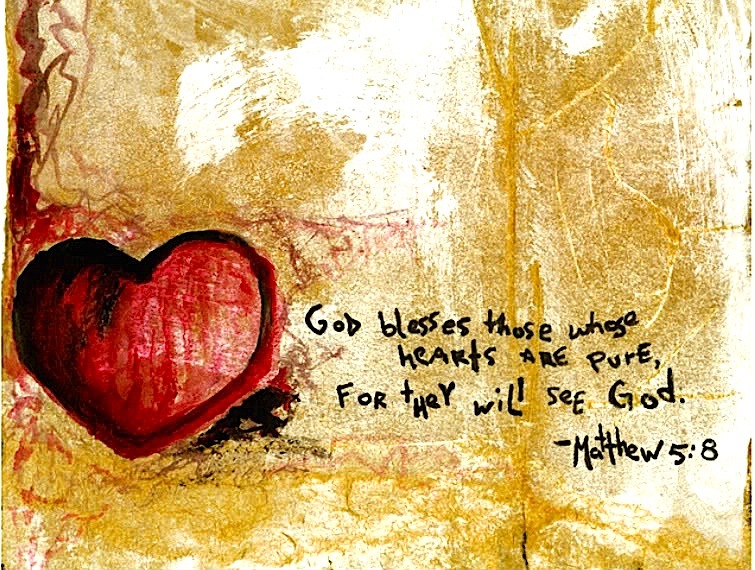 It is at the heart of God for us to be pure. God said, be ye holy as He is holy (in every aspect of our lives). God's rewards for purity are the blessings stated in His Word such as; freedom from guilt, good success, peace etc. When you are not pure, you are actually cheating yourself of these blessings from God. It gives you a healthy heart. Your heart will be free from the weights of malice, sorrow, unforgiveness, selfish ambitions, conceited. . .
How can I be pure? It's a choice. It's a choice that we have to make. It is what we have to stand for. The Grace is available for you. Titus 2:11-13. Wash your mind and feed it with the Word of God continuously. (Practical steps - Start from the New Testament, read a chapter every day, pray before reading it, take prayer points from the chapter that you read, and tell God about how you need His help in applying it into your life). Automatically delete the impure button in your heart when your thoughts start becoming impure. Don't focus on the reason as to why you cannot be pure. Focus on why you can stay pure. Focus on the rewards of staying pure. Apply self-control! 1Tim 1:7 states that God has given us the spirit of self control, MAKE USE OF IT! Distract yourself with a pleasant thought when your thoughts start wondering in the wrong direction and most importantly, always ask God for help. If He has asked us to be pure in our thoughts, He definitely would provide help when we're in need of it. Humble yourself, admit your weakness, ask God for help. Joel Osteen said: "Our minds work a lot like a computer. The way we program our thinking will determine how our lives are going to function. You can have the most expensive, powerful computer you can find, but if you load the wrong software, it’s not going to perform at its best." Whatever you feed your mind with, will determine your tomorrow. Anything that you feed your mind with, will drive your emotion. Anything you feed your mind with is likely to control the action that you take in reality. Remember that every temptation is an opportunity for you to choose to do the right thing.